Get announcements of new topics and important updates to existing topics from the City of Ann Arbor in your RSS reader or emailed to you as a daily digest. Thank you to all who participated in the S. Seventh/Scio Church and S. Seventh/Stadium Intersection discussion (March 4 through 17, 2019). Results and next steps are summarized below and will be shared at a public information session on Thursday, April 25 from 6:00 to 7:30 p.m. in the Media Center at Dicken Elementary School (2135 Runnymede Blvd). S. Seventh/Scio Church - Concept 4 will be constructed at this location. Visit a2gov.org/scio for more information. S.Seventh/Stadium Boulevard - The community discussion about this intersection is on-going. The final decision for this intersection (anticipated late fall/early winter 2019) will be based on community feedback, possible traffic circulation changes, additional data collection, and engineering analysis. Visit a2gov.org/seventh for more information. At the information session, City of Ann Arbor staff will share results of the March 2019 public engagement and review plans and next steps for the intersections. The information session will be held as an open house. Staff will be available to answer questions. Please join us! We are looking for your feedback about existing conditions and proposed concepts to further modify each intersection. The deadline for online feedback is March 18 at 9:00 a.m. Additional project information is available at a2gov.org/seventh and a2gov.org/scio. Please take a few minutes to complete a brief survey and share your input regarding the addition of bicycle lanes and potential removal of on-street parking along N. Seventh Street (from Huron to Miller). Draft concepts have been prepared, which range in impact to existing parking and availability of dedicated bicycle space. We're looking for community input to help identify the preferred concept. The deadline for online feedback is August 10 at 9:00 a.m. Additional project information is available at a2gov.org/seventh. UPDATE: The deadline for online feedback has been extended to July 29. Please take a few minutes to complete a brief survey and share your input regarding the initial design of the Nixon Road Corridor. The project limits are between north of Huron Parkway roundabout to south of the M-14 overpass and excludes the recently constructed Dhu Varren roundabout. Additional project information is available at a2gov.org/Nixon. We want to hear your input about the proposed Traffic Calming Program Update. Please complete this survey to share feedback regarding the Program objectives, engagement process, project area qualification criteria and toolbox of devices. Please allow 10-15 minutes to provide thoughtful input on this survey. The deadline for online feedback is July 6. Additional project information is available at a2gov.org/trafficcalming. Please take a few minutes to complete a brief survey and share your input regarding the initial design of the Nixon Road Corridor. The project limits are between north of Huron Parkway roundabout to south of the M-14 overpass and excludes the recently constructed Dhu Varren roundabout. The deadline for online feedback is June 29. Additional project information is available at a2gov.org/Nixon. If you are an Ann Arbor business owner, the Commission on Disability Issues wants your feedback. Please take a few minutes to complete a Closed-Caption Ordinance survey. Closed captioning ordinance feedback is being sought. Please take a few minutes to take the brief survey. Between April 6 and April 29, 2016, the city is conducting an A2 Open City Hall online survey to evaluate residents’ interactions with and attitudes about deer in the city of Ann Arbor, as well as, attitudes toward the city’s deer management plan. The survey, available at www.a2gov.org/a2opencityhall, will take approximately 15 minutes to complete. In order for opinions and experiences to be captured, participants must register and sign in to A2 Open City Hall. Although you can choose to provide anonymous feedback, registration is required, which allows results to be mapped by ward. In consultation with the UM Survey Research Center, survey questions underwent an expert panel review as well as focus group pretesting to minimize bias and ensure question clarity. Per resolution, City Council directed city staff to conduct an A2 Open City Hall survey in the spring in order to gather feedback about deer management efforts and include responses in a deer management report due to Council in May. Recently, an A2 Open City Hall topic was featured seeking community input regarding Seventh Street Transporation. 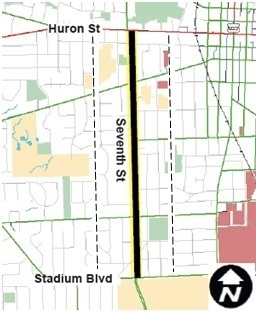 As a result of this feedback and other public input opportunties, the city has posted a second A2 Open City Hall topic which includes design alternatives for consideration along Seventh St. (from Huron to Stadium). Please take a few minutes to answer this brief survey and register your comments and feedback. 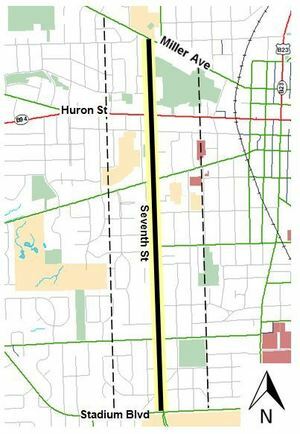 The city is seeking feedback about transportation along Seventh Street (from Huron to Stadium) and would like you to take a brief survey to register your comments and feedback. In addition to the A2 Open City Hall survey (www.a2gov.org/a2opencityhall) we invite you to attend a public workshop to talk about transporation alternatives on Seventh St. The meeting is scheduled for Wednesday, June 4 from 6:30 to 8:30 p.m. at Bach Elementary School.